The goal in Line 4 Tetris is the same as in Line 4: to place 4 pieces in a row vertically, horizontally or diagonally..In the lair, the game is played on a 8x8 board. 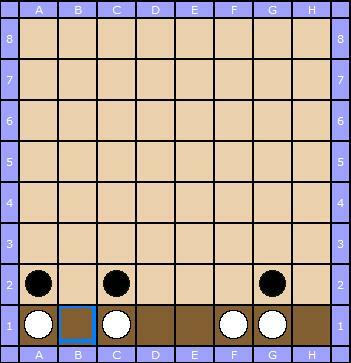 But pay attention to the following rule : If, when placing a piece, a player fills the bottom row, this row will disappear like in Tetris, and the pieces of the others rows 'fall'. In this case, if the player had bult a row of ' pieces, he won't win, because the row, that contains at least one of the 4 pieces will dissapear. 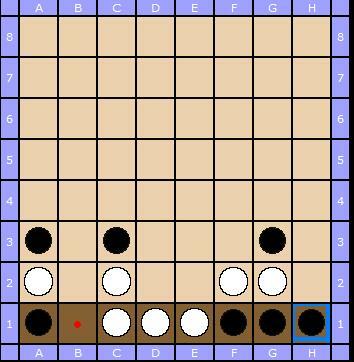 The 2 images belows show this, before and after that white plays B2, building a row of 4 pieces that will disappear, unfortunately for him.